Did I get your attention? I hope so! I have been studying my hoo doo books and looking at the folk medicine magick that surrounds all of us, in so many ways. Hoo doo has influenced and been influenced by the magickal recipes and traditions of so many cultures and creatures. I am constantly amazed by the cross overs. Things that I have done out of intuition are founded in the cultural and spiritual concepts of what many call folk magick. Personally, I don't care what you call it... as long as it works! So... here is something to share with you, in case you needed a little quickie pick me up! Want to sweeten a situation or influence a person sweet to be sweet to you? Grab a small bottle, clean it and sage it. Add a pinch of sugar or a drop of honey to it. On a small slip of paper, write the situation or the person's name in the center. Fold the paper toward you, 7 times, then pop it in the bottle. add an oil or herb to influence the deal and top off the bottle with more sugar or honey. Cap the bottle, and roll it in between your palms, praying to your higher power for the highest good of all involved. Some like to quote Psalms over the bottle. Find a nice quiet spot on your altar or in your garden and place the bottle there to rest. Use these recipes at your own risk. Power and Energy are safe for some ... not so much for others. Use good Common Sense and Remember the RULES for KARMA. * What you set out toward others will come back to you 13 fold. * You have the option to break the cycle. * Acceptance of the lesson can come in the form or acknowledgement. Some say... 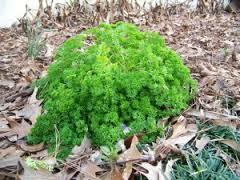 If you are in love, you should never cut parsley, for you will be cutting your luck as well! I am ready to start brewing up some wonderful herbal remedies! One of my favorites of all time is Comfrey! I use it in most of my best soap recipes! It's so soothing to the skin, and to the entire body... and it's a pretty plant too! Easy to grow...! So... here is something to think about! Are you a little nervous about doing a bone scan to check for osteoporosis? It's just crazty! I really don't want to buy into all the crap about going to the doctor for an annual check up... but sometimes you do need to know what is going on ... sometimes...! 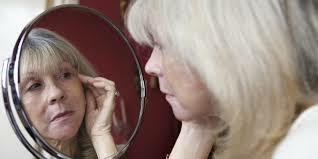 So... if you want to check your bone density, take a gander in the mirror - at your face...! The deeper the wrinkles on your face, the more bone mass you may have lost! Since collagen holds bone and skin together, looking in the mirror tells you the correlation between the two... more wrinkles, less collagen! 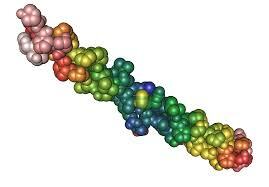 strengthening bones and reducing wrinkles. Make a comfrey infusion and then use it! Infuse water, honey, Olive oil ... you can make it! Use fresh or dried comfrey leaves to make a comfrey infused honey for use on your face for quick facial or to put on your bread or in your tea! place leaves in a jar that has a tightly closing lid. Add honey on the top of the leaves. Shake once daily for about 2 weeks. Remove leaves from honey. 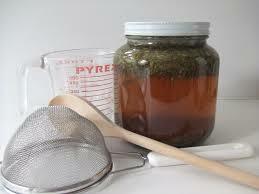 Use a canning jar to make comfrey infused oils. I use oils on my skin instead of a lotion ... or I make a homemade lotion out of the infused oils! 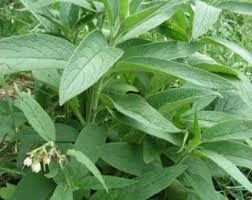 Use 1 oz of comfrey leaves with 2 cups of oil. Put the leaves in the jar, cover with the oil of your choice. You can use olive oil, sweet almond oil, hemp seed oil.. the list is endless! Put the lid on tightly and shake once a day for 2 weeks. put the lid on and place jar in a pot of water on the stove. Turn the burner on low and allow to heat up for an hour. turn off and allow to cool. Repeat the heating and cooling process several times over the next 3 days, allowing the slow gentle heat to help the herb infuse the oil. Make a "tea" infusion to drink or to bathe your skin in. Get one of the larger canning jars. In a large pot, boil up about a pint of water. 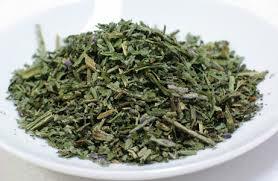 drop 1 tablespoon of dried comfrey leaves into the water and allow to cool down. 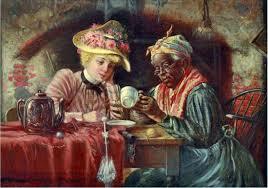 Pour 'tea' into the canning jar and allow to sit for 1 day in the refridgerator, shaking the jar once or twice. pour the tea over a wash cloth and place over your face for 10 minutes as a quickie facial . This page is a suggestion of herbals to use in your life... it is not a medical prescription or advice. Please consult a medical doctor about your health issues and challenges. 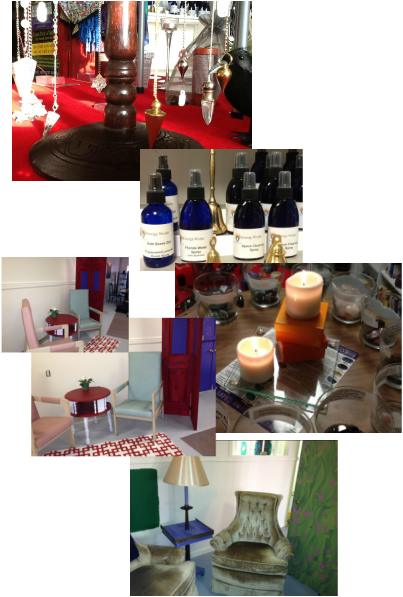 I have put together a wonder-filled shop... a wonderful staff... and had more fun that I could have imagined! But now I am offering the setup up for sale! $8,000 and it's all yours! Store Fixtures: Jewelry case, shelves, tables, book cases, dividers, chairs, chairs and more chairs! Just thought we woud share! 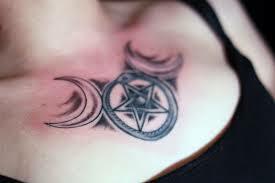 Many Spiritualists, Pagans and Wiccans use the Pentagram and Pentacle in their lives. The five points of the star have many meanings. Some attribute the five points to the four directions and Spirit. Another thought is "as Above, so Below" which is attributed to the double triangles you can find in the star. A pentagram is a five pointed star, with the one point aligned upwards and drawn with 5 straight strokes. A pentacle (also spelled pantacle in Thelema, following Aleister Crowley) is an amulet used in magical evocation, generally made of parchment, paper or metal (although it can be of other materials), on which the symbol of a spirit or energy being evoked is drawn. 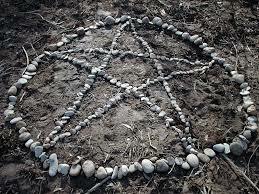 A pentacle is generally defined as an upright pentagram surrounded by a circle. "A circle around a pentagram contains and protects. The circle is symbolic of eternity and infinity, the cycles of life and nature. The circle touching all 5 points indicates that the spirit, earth, air, water and fire are all connected. 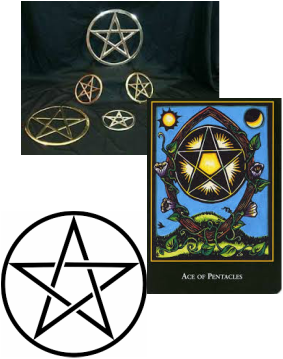 The circled pentagram is the passive form implying spiritual containment of the magic circle, in keeping with the traditional secrecy of witchcraft, and the personal, individual nature of the pagan religious path, of its non-proselytising character." The Pentacle is a sacred symbol that is used for ceremonial magic, to draw material gains toward oneself. It's also used to invite protection to a person or place. It can be used in conjunction with other sacred symbols such as runes and Sigils. 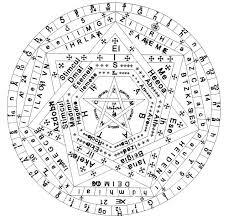 The Sigillum Aemeth is a Highly complex pentacle and it is to be done of pure wax about 27 inches in circumference. There are many uses for the pentagram and pentacle, both for ceremonial and daily magic. 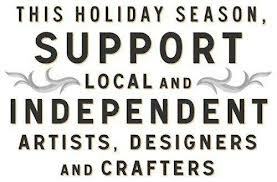 You can use empower jewelry, candles, even yourself if you choose to have it tattooed on your body! This is by no means the be all and end all on the five pointed star, but just a little prompt for you to look up and gather your own information! The Pentacle of the Ark as given in The Sixth Book of Moses (a 19th century version). Up until medieval times, the five points of the pentagram represented the five wounds of Christ on the Cross. It was a symbol of Christ the Savior. This is in stark contrast to today where the pentagram is criticized by modern Fundamentalist Christians, as being a symbol of evil. The church eventually chose the cross as a more significant symbol for Christianity, and the use of the pentagram as a Christian symbol gradually ceased." Herbal Verbal for the new year! This new year being 2015! In Numerology, the year of 2015 is reduced down to the number 8... the symbol for infinity, wealth and achievements! Whooo Hooo! So now would be a great time to reflect on what it is - clearly - that you wish to accomplish! Start out with a cleansing - cleanse your house, your personal effects, and then your body. Below is an herbal recipe to help you along! Make an infusion by adding the ingredients to a bowl and pouring 3 or 4 cups of almost boiling water to it, let it seep for about 15 minutes and then add some sea or Kosher salt to it. 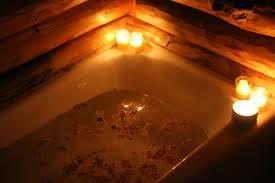 Draw a tub of warm water and add the infusion, after you have cleansed your house and personal spaces. Then climb in and soak and meditate for a bit. This is ideal for clearing out challenging energy, negative thoughts, crossed conditions and to cut ties with the old responses. Challenging thoughts will dissipate, becoming new ways of discernment and creative actions! All bumps and roadblocks will clear from the path you have chosen! Challenging people are now enthusiastic endorsements for creative actions or they are no longer involved in the life you are living! Things come to you with EASE and GRACE! Friends, loved ones, and people in your life assist you more as you move toward your success and happiness! You are financially rewarded in a manner that is greatly amplified! You are recognized for your achievements! At iiEnergy Works, we find our best results in order of three. So contemplate - mediate on the things that you intend to bring into this fabulous new 2015, and then add some candle magick to it! Solstice was on December 21st! Now is the time to try to plan to set aside some time and build a fire to burn away some of those things you planned to release for the new year... If you do not have access to an outdoor firepit, or barbecue, you can burn it outside, in an open space, and use an earthenware bowl or metal pan. Do be careful and keep the flames under close watch! Verbally thank the Earth and consider making an offering to the Earth of a tiny stone or crystal to thank her for all that she carries for us. All these things are little beliefs that keep us from moving forward into our path. We can start here and begin to process this out as the new year enters and heals us. Us this time to bring yourself to a place of release and renewal. 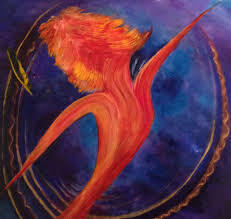 "Imagine if we felt held enough by the Universe, by All That Is, and could shed the old skins to allow a rebirth when the light returns...imagine if we could hold our visions for ourselves as visions for the world and see how what we do as visionary women ripples out and is in alignment with the new consciousness trying to awaken everywhere. The shortest day of light of the year. And I move toward it gladly, not only because it brings an end to the year by putting us in darkness for a longer period of time, but also because that darkness will, if we let it... bring us a chance to go deeper into our psyche for review and renewal. Candlelight is a way to bring light and life. The flickering of the burning wick activates our inner wisdom as it flickers in our eyes. The flame flutters as it burns away the darkness with little puffs of smoke. 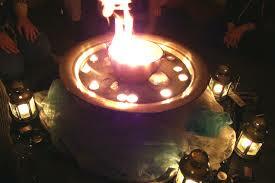 The intention is for bringing together elements for protection and introspection to reflect on the past year. Read these directions fully before you start. Allow yourself AT LEAST 30 minutes for this process. place them on a table in front of you. 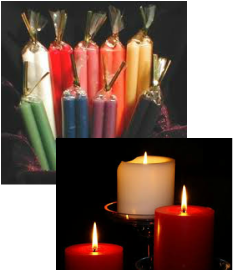 The end result will be a lit candle on your altar or in a honored place in your house. Verse to use (if you choose) as you anoint your candle with the peppermint oil. time to reflect on the old and new. difference of light and dark. * Blue candle with the peppermint rubbed on it in the middle of the dish. * Place the Juniper berries around the candle in the dish. 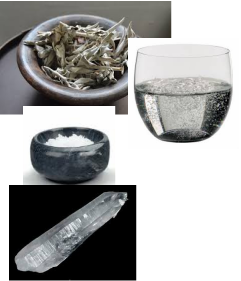 * Place your clear quartz stone on the left side of the candle dish, about an inch away from the dish. 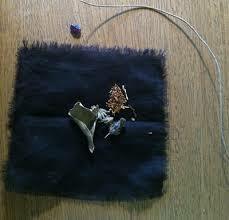 * Place your obsidian stone on the right side of the dish, about an inch away from the dish. * Place the rose quartz around the center, aligning with the directions of East, South, West & North. * Place pine branches on the table, near the North side of the table. As you place each item, speak out loud the reason the item is there. Blue candle: Lighting the darkness, driving fear away, allowing introspection and releasing energy that is no longer needed. 4 rose quartz stones: Symbolizes the safety and protection of Love in our lives. Obsidian stone: Symbolizes the dark that we are leaving behind and the ability to look at the darkness in order to find balance. Pine branches or garland: Pine is used to purify and cleanse. In this instance it is used for discernment as we look at the past decisions so as not to make the same choices that do not serve us in the future. Pen & paper for any journaling after the lighting of the candle. Light the candle and gaze at it for a few moments as you collect your thoughts. Take the pen and paper and write in a stream of consciousness any words or phrases that come to mind. Allow your focus to wander as needed. Write down anything that comes to mind about the past year. Examine what you may or may not have enjoyed from the situation. Do not dwell on a single incident. Write a few sentences and then move on. Continue this for about 7 to 10 minutes, writing about anything that you remember at this time. At the end of the time, take the papers you have written on and fold them together into 3rds. Slide the papers under the Pine branches as the candle burns. Allow yourself to sit and look at the candle flame with a soft gaze for a few moments and then let your eyes close, as you contemplate the past year, with love and contentment. Gather the pages that you placed under the pine and tear them into bits, with the intention of releasing all regrets and sending love and light to each situation. You may discard the pages either in the trash or by carefully burning them in an outside receptacle. Do this ritual as many times as you wish during the week before the Solstice. Each time you light the candle, allow yourself to go to a place of love and understanding as your intent is to review and release energies and lessons that no longer serve the highest good. The blend for this week will be about bringing our thought process into a state of introspection. and a look into the why of it. * You have to option to break the cycle. 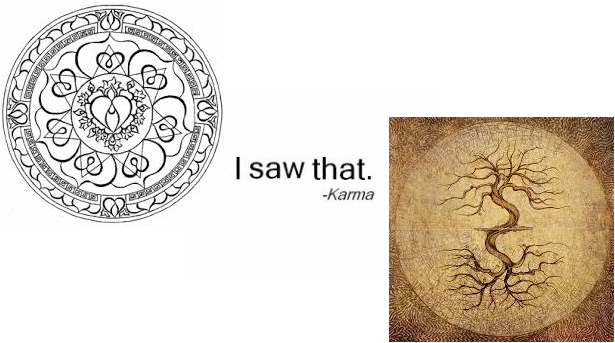 Karma can be a blessing or a scourge... you can choose. * Sage and a dish or bowl to burn it in. Wash your hands with the intention of cleansing yourself entirely. Make a space for a mini altar... this can be a table or a corner of your room. A special little place that will not be disturbed for a while. Light the sage and move around the smoke around the space with the intention of clearing out any energy that is complete and no longer serves you or your household. Move throughout your home with the sage with the same intention. Place the dish with the sage on your mini altar... I like to put it on the front center area, to act as a cleanser for anything else I may add to the space. Hold the bowl of water in your hands and envision white light going into the water and purifying it. Place the bowl of water on your altar ... I like to place the water on the Western side of the table... if you chose to follow the Pagan standards. Allow your thoughts to go to finding the courage to face your deepest feelings and embracing them for learning and release. Hold the bowl with salt in it in your hands. Envision white light going into the salt to purify and brighten it. Place the bowl at the Northern side or your altar. This is for clarity and enlightenment. Hold the crystal in your hands. Envision white light going into and around the crystal, clearing out any previous programs or energetic thoughts. Ask the crystal to work with you during this December ritual. Place the crystal where ever it feels right on the space. Sit or stand beside your mini altar. Allow time for meditation before you need to go do something else! Focus on the feeling of the earth beneath your feet. Focus on your body as it sits or stands beside the altar. Allow your focus to reach out to each of the elements that you have place on your altar. Sit with yourself. Allow your thoughts to flow backwards to the previous actions and activities of the past year. Allow this to happen as if you were watching a video... fast forward through anything that does not need attention. Slow motion for the things that stand out. Look at the lessons. Look at the actions that may need an apology or forgiveness. Make the apology and forgive. Allow yourself time to accept the actions. only a few moments... don't dwell! And then move forward, bring your focus back to the water, salt and crystal on your altar. as you ground yourself by bringing your attention to your feet on the earth. Use with grace and ease as you recollect and release all that no longer serves you. You are readying to move into the new year of 2015.